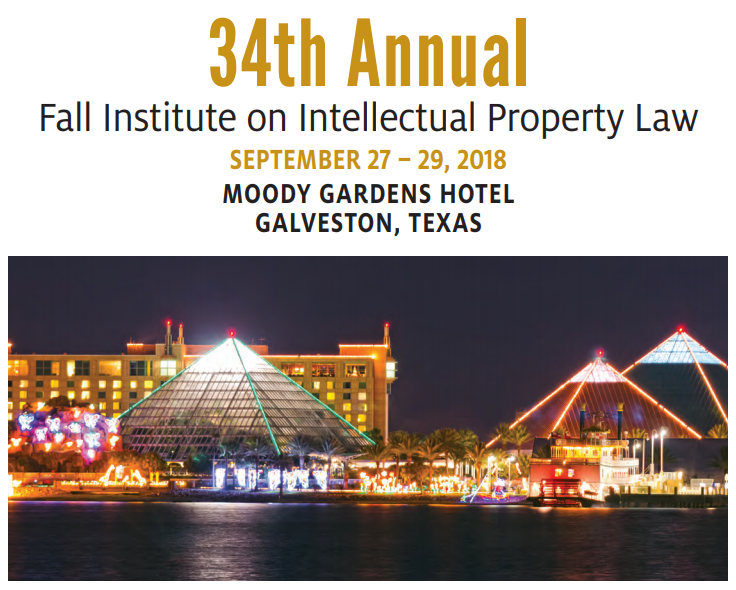 The 2018 Annual Fall Institute on Intellectual Property Law will be held on September 27 through 29, 2018, at the Moody Gardens hotel in Galveston, Texas. HIPLA has put on the Fall Institute in association with the University of Houston for the past thirty-four years, and we are planning an exciting, not-to-be-missed program for 2018. This year's keynote speaker is Dennis D. Crouch, associate professor of law at the University of Missouri School of Law. Professor Crouch is the founder and lead author of the nation's leading patent law blog/resource, Patently0. Speakers' papers will be provided in an electronic format You may purchase the materials without attending the conference for the fee specified on the registration form. Refunds will be made only if they are requested in writing. If you do not attend the program and do not request a refund, you will be mailed the materials in electronic format. This program has been approved for Minimum Continuing Legal Education credit by the State Bar of Texas for 14.75 hours, including 4.0 hours of ethics credit. If you have any questions about the program, please call the UH Law Center's Institute for Intellectual Property & Information Law at 713.743.2180. The Institute will be held at the luxurious and convenient Moody Gardens Hotel and Convention Center in Galveston. The Moody Gardens Hotel is located in Galveston, Texas, on Hope Boulevard. From Houston, take I-45 South and exit at 61st Street. Turn right on 61st Street and again on Stewart Road. From Stewart Road, stay in the right lane to go onto Jones Road. Turn right onto Hope Boulevard. The hotel will be on your right.